I shipped off 29 articles of clothing and four pairs of shoes. They accepted nine items and two pairs of shoes. I made $36. Do I recommend ThredUp? Yes. And now for the long-winded version where I analyze my feelings and the motives of the wicked world that is consignment shopping. They accepted 11 items, which is great. But they also rejected 22 items. Bam. Huge hit to the ego, right? That ratio wasn’t awesome, but REMEMBER! I sent it all away with the mindset that anything is better than nothing. That’s why I count it as a success. That’s why I’ve already requested another bag. I made enough to pay for a few guilt-free lattes at Starbucks, not to mention the part about me off-loading a bunch of stuff I should have gotten rid of a long time ago. Hours after I sent off my bag I decided to Google seller reviews, and nearly everything I read was negative, written by people upset that their stuff wasn’t accepted. The reviews were so acrimonious that I could feel my blood pressure rising as I read them; I even started to feel embarrassed that I sent so much stuff away without researching first. I really, really started to wish I’d sold stuff on eBay or maybe a local consignment store. But then I remembered why I got so excited about ThredUp in the first place. It required very little work on my part (all I had to do was request a bag, pack it, and put it on my porch). I might have made more money through consignment or eBay, but it would have taken considerably more work. At the very least I would have had to get in my car and…bleh I can’t even think about it beyond that. If you do this sort of thing, prepare to be indignant. Prepare to get really defensive and proud of your old clothes that you never wear anymore. You have to get your mindset right. If you’ve ever tried to consign clothes, you know that all consignment shops are extremely picky. I’ve taken my awesome, name-brand stuff that I used to get lots of compliments on into a consignment store and left with every single item because it was from two seasons ago or it has “pre-pilling.” Selling clothes seems like an easy way to become a millionaire, until you actually try to do it and find out that no one wants to spend close to retail price for that shirt you’ve worn three times a week for the past five years. When someone is standing right in front of you, rifling through your clothes saying, “out of season, too much stock, too worn” you can’t really argue. But when an Internet company anonymously just rejects your clothes, you get indignant. You write a bad review. I didn’t have a bad experience, and my neighbor sent away a bag and didn’t have a bad experience, so hopefully if you decide to try it you won’t have a bad experience either. Just prepare to be indignant. I’ll admit, when I realized they didn’t accept even one of the five Hollister tank tops I bought in 2005, I was miffed. But then I considered that they DID accept a 12-year old skirt from Loft, and I figured it all worked out ok. They might not accept your stuff; don’t take it personally. Their acceptance guidelines are clear (they also have a helpful payout calculator), and my closet is cleaner thanks to their model. – It takes a while to get your money. From the day I ordered my bag to when they processed it took about a month and a half. – Anything they don’t accept gets donated. If you want it back you can pay upfront and they’ll return your stuff. – They don’t itemize what they don’t accept. I’m not sure why that surprised me, but when I got my email about what they DID accept, I immediately wanted to know what they didn’t accept and I couldn’t remember. The next step is becoming a buyer. I’m on the lookout for a new-to-me bag, and what are the odds I could find a rain jacket for Mary Virginia? Has anyone else used ThredUp or have experience with a different consigner? What was your experience? Glad you think they’re an upstanding company but I think they are a scam. I sent a stuffed bag full of appropriate clothing (based on their guidelines) – many of which were brand new with tags still on them. Out of 60 items they too 6 and after deducting my shipping they paid out $5.05 – so laughable. I could have sold that stuff on Ebay or through local buy/sell/trade FB groups for twice as much. The insult is to see how much the 6 items actually sold for (because they actually show you which items they selected and how much they go for!) – the sold them for $73 and I made $5…. I’m not looking to get rich but I am looking for an honest company and ThredUp is not it. Agree 100% – complete scam. They accepted nearly everything in 2 giant bags I sent them and then 2 pieces from a 3rd bag. I could see that they listed all of these items for well over $300. I received slightly over $3.00 after process fees. Complete rip off, I will donate tot the salvation army fomr now on. If I’m going to give my clothes away I’d rather it be for some good not some online for profit scam of a company. I think they are a scam too. They weren’t at first. After they figured out they can rip people off so they do. I sent 3 very full bags and I got 28.00. One item was a Kate Spade bag w/tag. They sold that one item out for about 100 and paid me like .50 cents. I cannot believe they would do this to trusting people. I wish i had donated all of that clothing where it would help people, not just from me to get rich. I will report them to fraud and scam sites and BBB. It’s telling that they don’t include a single line on their site about how you will be compensated as a seller, but on their ‘Terms’ page they outline in a hundred different ways that you wave all rights (effectively) to a claim against them in case of dispute. Aside from the fraud and ill will they create they are diverting money from charity shops. I totally agree with you joanne. It is a scam! Check out the Better Business Burea page on them. I came across this post while searching for “Thredup Experience”– what a great assessment! I recently sent in two bags of stuff and was satisfied with the experience. Having sold on Poshmark and Tradesy, which I do recommend, I really just wanted to get rid of a lot of stuff FAST and with little effort (clearing out for a baby on the way!) I think people who expect a lot more aren’t being realistic about how businesses like this work. They post clearly that items under $15 will get 10% back. So my Express tank top which was originally $20 is going to sell for 5-7 bucks, and I’m getting a fraction of a dollar. Maybe that doesn’t seem fair, but they DO post their guidelines. Also, the reviews for buying are really great– you can score great deals because they don’t pay a ton for the clothes. If you have the time to sell things more slowly to get more for your items, do that, but Thredup is super convenient and can be wonderful to make some extra change. Yes EXACTLY! That break-down makes so much sense. Since I wrote this post I’ve purchased a few things and I’ve had good experiences. The descriptions are great, and I had to return something and that was simple, too. Congrats on the baby on the way! 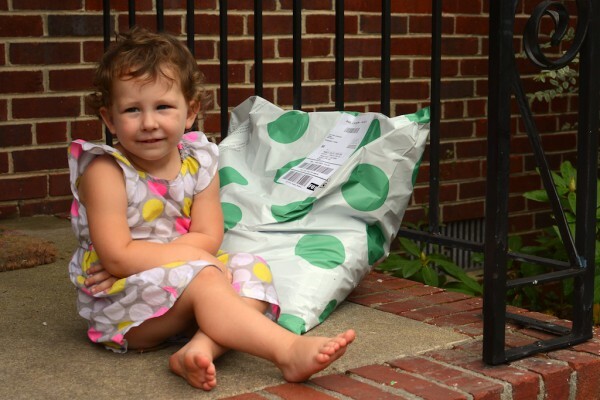 ThredUp is great for my stuff, but it’s AWESOME for buying and selling kid stuff! Change is right. You don’t even get paid a dollar for each item that they accept. Then they charge you for sending the items to them. They ar the seller they should be paying the shipping charges. It is not like they can’t afford it. This message brought to you by the PR department at ThredUp! Thank you so much for being the voice of reason on this topic! My daughter and I just dropped off our first closet clean out bag off at the post office today. For some reason, I decided to search ThredUp reviews AFTER we got home. I was beginning to completely freak out after reading a bunch of complaints. The more I read, the more unreasonable I began to see that they were (people claiming that they lost $200+ per bag they sent in). Surely no one actually thought that they would get anything close to full retail for their items, did they? We typically donate all of our clothes, but I decided to try ThredUp to motivate my teen daughter to keep her closet inventory at a reasonable level. I think this will continue to do just that. She’s not expecting much and any amount will be welcome to help offset the price of acquiring new (to her) clothes. I’m glad you appreciated my perspective 🙂 I hope your daughter has a good experience! The buy-back breakdown in the comment above (from Delia) is really helpful! Hi! I’m a regular mom person with a toddler and could not agree more with your fiscal shrewdness and positive objective response. I love ThredUp and a friend sent me your post because I talk about this company a little too much. I dislike keeping clothes I dont wear, I want to spend little or less on clothes, and rather than dumping on family or friends I can believe the good people at ThredUp will donate what won’t sell. I have bought and sold about 7 times and will keep them in business. Also, maybe I am blind but I didn’t see anywhere that says there is a $20 minimum cash out. This has nothing to do with my ego. Ugh, that’s annoying. I hope they didn’t also charge you for the return bag?? I’ve never asked them to return my clothes, so that’s never been part of my experience. However, I have had to contact customer service before (I’ve bought and sold several times since writing this) and have received prompt responses. I’m sorry your experience wasn’t the same! I also don’t have experience with the minimum cash out? I did not have the same experience. They did however deduct 7.99 from the 12.00 they have me for two brand new pair of Anne Klein shoes and two Tribal jackets. Rejected three sweaters from NY and Company and a pair Arphoplego slides ( new).So after they deducted the shipping for the clean out bag I would have rather donated it to a local charity. The Items they do not accept are not donated. At least not until they’ve tried to recycle them for profit or sell them to a third party. Which is fine. Oh really? How do you know that? I’m interested to know! I just got my info from their website! What happens to unaccepted clothing? ThredUP works with different organizations, wholesalers, thrifting companies, and charities who distribute, resell, and recycle this unaccepted clothing. We do receive a nominal amount of compensation for these items which is used to help offset a portion of the shipping costs incurred when customers send us their Clean Out Bags. I also don’t think it’s a matter of hurting my ego, but i really think they are off in their appraisals. They took a Loft skirt that was worn on many occasions and rejected a beautiful blazer-of course in my opinion- that i only worn once and for which i paid almost $55 (on sale). I hope it’s true that they donate the unwanted clothes and don’t make a profit from what they reject. Also i had no idea about the $20 cash out minimun. Im going to be forced to buy something soon so i can close my account. I have to admit that the process is very convenient though. Lengthy but convenient. They don’t donate, they “recycle” your leftovers, meaning they sell your stuff to thrift stores for pennies and that adds up to a hell of a lot for them considering the ratio of clothes they don’t pay us for. You’re better off having them send back your unwanted items to do with what you please. Took more than two months to hear from them and my bag of designer clothes netted $1.60. That’s right: $1.60. Not even enough to buy a cup of coffee. And to add insult to injury, I had to wait two more weeks to claim my cash! They don’t donate the clothes they don’t want, they sell them. On their how it works page, https://www.thredup.com/p/cleanout-how-it-works under “what happens to unaccepted items”, it says they are sold to third party sellers. Then scrolls quickly to a picture of happy kids with a caption that says the money goes to shipping costs, nothing to do with kids. Just so it’s clear what happens to your clothes. Not to say that it isn’t still a really easy way to part with emotional baggage and then have a little money to buy a few nicer things. You just can’t also feel good about donating to others in need. Thank you for clearing this up! I could have sworn they said they donated them when I first wrote this (or maybe I’m completely mistaken!) I’ll update the post to reflect this change. Thanks again! I have used thredup two times. One with adult clothes and the other with kids clothes. The first time I got more than I expected. Which was a nice surprise. The second time however wasn’t such a good experience. I ended up with 10.70, for 13 items. That’s like $0.82 a piece, while they were selling the pieces anywhere from 5.99 to 10.99.They were making about 98.00. Some of these items were NWT. Which I understand I wouldn’t get retail. But should have gotten more than $0.82 for a piece. I probably won’t use thredup again. I actually had a really similar experience — my first bag was great (which I blogged about here) and my second was pretty disappointing, and my neighbor had a similar experience. I actually have a secret theory that they do it on purpose. They’re generous with the first bag to hook you, then subsequent bags aren’t as well received. I’ve had GREAT luck with purchases though. My new favorite top, bag, and dress are all ThredUp finds. Sadly they aren’t always nice on your first one either. I received a measly $5 on a full bag. I did my research (sadly only on their site and not looking for other reviews) and know they were all new, new without tags, or worn only once. I also made sure they were brands they accept. They only accepted 29%! I was very disappointed with the experience. 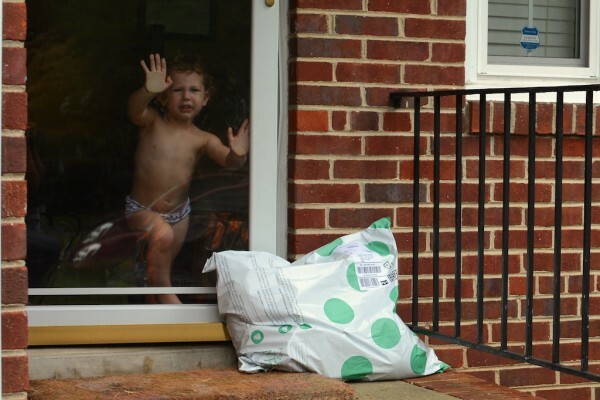 I found your post after requesting my first ‘thredup’ bag… YOU ARE HILARIOUS! You catagorized all my fears, and allowed me to work through every reservation. See… The whole reason I’m IN this position is because I did go to one of those chain consignment stores where some..half my age girl with ZERO taste, and bad hair rejected barely worn high-end brands from expensive boutiques and my pride was wounded. Bad! Sooo thanks again. I might just muster up the courage to do it… If… I can bear the thought of that ‘special find’ stuffed inside of a pillow for centuries. Gasp. I actually think it’d be a great test, take your clothes to a consignment store and see what they’ll accept, then take the same clothes to ThredUp. Consigning clothes just isn’t a way to make tons of money. Thanks for commenting! Also — your photography is beautiful! Another visitor who found this entry when searching on Thred-up experiences. I think it’s important to share this information so women who chose to buy from Thred-up know that other women are getting ripped off in the process. This is not about ego; here are my stats: I sent them 23 items all new with tags. I chose Thred-up intentionally for these new items since I figured there’d be no debate over condition. Only one ended up being listed as “New with Tags”, and I received a payout of $32.75. Just out of curiosity, you had a lot of unwanted NWT items, were you unable to return them to the original retailer they were purchased from? I am sitting on my bed room floor bagging my husbands clothes up (I recently read marie kondo’s book on the magic of tidying) and am laughing out loud at your post! You are hilarious! I too requested a clean up bag from thred up this weekend and was curious about other’s experiences, googled it and BOOM here I am laughing and distracted from the task at hand. 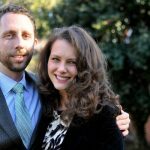 I’ve sold to ThredUp numerous times, and I’ve been fine with it. I’ve always donated old/unwanted clothes, shoes, and handbags to Goodwill, and at least this way I can make a little bit of money and it’s no extra effort. I also remember getting worried the first time I sent off a full bag and thought maybe I should have tried selling the nicer stuff on eBay, but that’s too much work for me! I used to sell to Plato’s Closet a few years ago, and you have to wait in the store while they go through your stuff and price things out, and there is usually a long line. ThredUp is way less of a hassle, although they take FOREVER to finally offer a pay-out. I sent in my last bag at the beginning of August, and their estimate for processing is mid-October lol. Yes! And now there’s a long wait even for a clean-out bag! But I’ll take that over waiting in line at a consignment store or the hassle of listing stuff on eBay, etc. I just read your blog and feel better about filling up my bag which should arrive any day now. Like most people, I chose to research reviews AFTER I ordered my bag! LOL! I surely will be much more selective on what I put in this bag, and I’ll have another pile on hand for the donations. We’ll see what happens with ThredUp, but in the end I’ll see more space in my closet! Eye on the “real” prize! Thanks for your thoughts! Found this post after googling and trying to find out other folks’ experiences with sending shoes to ThredUP. I asked customer service and they basically told me to throw them in the bag (“you can bubble wrap them if you want”), that concerned me a little since both pairs are new with the boxes and I wonder if they will look new when they arrive. Anyway. Glad to see others’ comments. I don’t mind not making much money – it’s more than what I would make if I donated – but I do mind paying shipping both ways for something that’s high end, new, current season, and rejected. I guess if you bought and sold often you could even out the win/lose. I understand they can accept whatever they want – they have to make money too – but I probably won’t send my bag in without trying the consignment shop down the street first. I will say that I have had good experiences with their customer service department. Probably will continue to buy, with caution (sometimes we disagree about the condition of items), in general the deals are pretty good. I’ve sold shoes before and I think I put them in the original box. But I do know i sent my son’s shoes and I just put them in a Ziploc to keep them together and they accepted them! Question — what do you mean paying shipping both ways? Do you mean sending it to ThredUp? I checked to see if their shipping policy has changed (when I wrote this, shipping for the clean out bag was free both ways, but several of their policies have changed in the short time since I wrote this!) but I couldn’t find anything. I actually think it’s a great idea to check with consignment stores first. If it wasn’t so difficult for me to coordinate that sort of thing with my kids in two, that’s what I’d do, too. Let me know how your experience is as a seller! I found your post while researching. A bag costs $9.99. I have several things, NWT, I purchased before an unexpected abdominal surgery, and I will never wear them again. I think I will donate them, as I know the charity will get more than the pennies they would pay me. Several reviews indicate people OWED them money because of the postage cost. I’d rather donate it than take the risk of owing them money. The average seems to be $0.30-$.80/skirt. One would have to send them an awful lot to account for their rejection rates and postage. Hi! The charge of $10 is a change since I initially wrote this post. Clean out bags used to be free. I might edit it to reflect the change because I agree with you, that makes a huge difference. And the idea that you might owe money is really upsetting. You could wind up owing them a lot. $9.99 to send them a bag, then, if you want things returned…. And, say only 3 skirts are accepted, for $0.35/each (per their calculator), you are already out almost $9. Then, return postage? I think originally, the things they could sell for rags (a huge market, just ask Goodwill), would cover the postage and operating costs not recovered by the acceptable clothes. Clearly, their costs were not covered. But, if people stop sending things in to sell, I wonder how long they can last? I’ve ordered a clean out bag, after visiting two local consignment stores. It appears I’ve got some “grades” of things to sell. Some of them are worth my time and effort to eBay, some things I’ll try at a local store, etc. The stuff I truly don’t care about and want the heck out of my house are going in the ThredIt bag. I’ll try anything once…. You were smart to visit the consignment stores first! Hope you have a good experience selling those items on eBay or at stores, and with ThredUp! Selling to ThredUp isn’t all it’s cracked up to be. They take forever to process your bag and then give you an insulting amount for a huge bag full of New and Slightly used items. It seems to be an all around win, win situation for them. Just give the items away or take the time to sell them on eBay. Sending items to ThredUp ends up being a total waste of time A full bag of clothes should at least equal enough to purchase one item from their site. My payout doesn’t even cover shipping! Terrible. It might sound dumb, but if I sign up for thredup am I forced to sell clothes to keep my account, or can I just buy stuff. yes! you can totally just buy stuff! Well, at first I found ThredUp intriguing. Sent in a bag of clothes, they seemed to take them all and I only made around 13 bucks. Oh well, I mostly wanted to clear out my closet. Did better the second time…sent in huge bag of clothes, got about 35.00. (Plus closet space in my house!) But boy was I surprised to see that it now costs 9.99 to get a bag and ship it to them. It means I’ll scarcely earn anything while lining somebody else’s pocket. So I’m done with them. I’d rather give it away free on Buy Nothing locally or donate to a thrift store. In addition, I’ve never found a single thing on their site to buy, not to mention that their search function is a mess. I’m glad other folks have had more joyful experiences. I’ve never heard of Buy Nothing, but do you have Freecycle in your area? The website is Freecycle.org. You enter your zip code, and are directed to the nearest group. You are recycling stuff, offering it for free, hence the name, Freecycle. Posts either offer things or are wanted posts, where a poster is in need of an item. We recently got two nice metal file cabinets, which helped me get organized. I’ve taken things and offered things. It saves a trip to the thrift store. People generally put the items out on their front porch, unless, like the file cabinets, they are large. And, you know that whoever replies to your post wants/needs the item. In our area things range from plants to toys to clothing to furniture, with everything in between. Our area has a sister site, knows as cheapcycle, and people sell things there. But, Facebook now allows commerce, and there are MANY selling pages for our area. Each town, the county, neighborhoods, and specific groups like craft groups. The advantage there is no fees to eBay, and no shipping. I hadn’t sold anything on ebay for a while, and I sold a couple things before Thanksgiving. They now charge 10% on shipping fees, because, people were selling items for $0.01, and charging $25 for shipping. I remember seeing that a few times, and thinking it was unethical. Someone always finds a way to scam the system. However, what I did find was that it is very difficult to sell smaller things. They encourage free shipping, which, can be expensive for anything fragile, or anything requiring insurance. From a buyer perspective, also a plus because no shipping. I think I’ll try one of those pages for the new skirts I was going to sell on ThredUp. I’m sure I’ll get more than 35 cents/skirt. Maybe, I’ll dream big, and ask $1. But, I’ve seen lots of nice things on there. Another site for buying, not selling, is shopgoodwill.com, which is the Goodwill version of ebay. Let me tell you now…. in many ways it is like ebay. There are no guidelines, so one store will post something for $2, and another store will post the same thing for $10. Geography and regional cost of living play a big factor into pricing. Also annoying is that some stores will ship an item, and other stores will not. I was thinking of starting a Goodwill Shopper FB page. I’d pick something up for someone and take it to a UPS store, or, depending on the item, put it into a box or envelop and ship it myself, as a favor. Furniture, I understand, but a basket? They sell everything. And, I mean everything. It is fun browsing through the listings. If it matters they will waive the fee if you add it to a paid order. I would like some proof that things are donated. How do we really know for sure that this is happening? I sent a leather coach purse that was in excellent condition and in a dust bag when it left my house. It was not accepted and they say because it had a scratch. Maybe this happened during shipping but who knows. Who knows that someone didn’t just keep the purse or sell it else where? I would like to know that it was actually donated. ThredUp is a total scam! I sent all brand new or barely used brand name items, including a very nice pair of Vera Wang boots, they accepted 7 items and gave me a lousy $2.65 !! What a joke! I’ll donate to my local Goodwill from now on and not some company making a killing off of ripping people off! I think it is a win-win only for ThredUp. I sent in 24 items all new with tags–clothes that I could not wear due to losing weight, clothes for teenage girls that my own children did not wear. All items were purchased new within the past 2 years. Took ThredUp over 1 month to review my bag. After reviewing, they accepted 18 out of the 24 items. They are paying me an average of $1.40 per item. Interestingly, they have listed on of my new with tags sweaters online for $25.99. And I only get $1.40?? Somebody is making money and it’s clearly not me. I would have been better to take the take write-off after donating items to the Salvation Army. My ego is not involved in this–happy to be rid of clothes that are too big for me & clean out a few items from my kiddo’s closets. I wish I would have done my homework before sending in my items. I think ThredUp is a ripoff for sellers. Payouts should be at least $4-$5 for new with tags items from Talbots, Land’s End, Abercrombie & Fitch, Hollister, etc. it makes me sad whenever someone mentions the ego thing — i was simply saying that it was a hit to MY ego. i’m not sure why everyone pulls that sentence out? i agree that it can be frustrating. i will say, i just sent in my fourth bag and i got $45, which was a shock to me because of all these bad comments! most of my stuff was jcrew and children’s clothes, which they do say on the site is some of their best sellers (also listed, mini boden, dvf and theory). you should try selling through ebay, or have you tried a local consignment store? taking my clothes to consignment definitely helped me prepare for selling through ThredUp. I spent almost a whole afternoon driving around San Antonio taking items to consignment stores. It was not only exhausting, but I got very little money ($30-40 for $300 worth of jeans). I thought about all the money, time, and gas that I lost. I am going to give ThredUp a try because at least I will come out a winner by not wasting my time and gas. I have a feeling that ThredUp may have some good charities to donate to with the items they don’t use. My take away in all of this is to be more careful with the clothes I buy for myself! I have way too much. I am trying to make wiser choices with my money. my thoughts EXACTLY!! wiser choices, buying quality over quantity. and i couldn’t agree more, the ease of ThredUp is hard to beat! 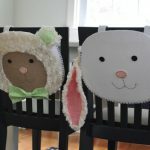 Did you find you made more on kids items? I just requested my first bag – not sure if I’m going to use it or not, though, based on so many negative reviews. But I have some kids clothing I was going to sell as lots on eBay, but I’m wondering if it would be easier (and even worth it) to send them to ThredUp instead? Yes! That’s an edit I was thinking I should add to the post. I’ve had MUCH more luck selling children’s items. I just sent in a bag and was shocked to make $45. Now, that’s not a ton of money, but based on so many bad stories I was very happy. Most of the bag was kid’s clothes and J.Crew, which ThredUp lists as one of their most popular brands. Let me know about your experience! 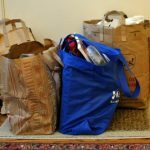 Over the last three years or so, I’ve sent in four or five bags to ThredUp. I’ve seen payouts gradually decrease, though I’ve always been surprised by the items they don’t take (brand new, unworn items, or items they specifically request on their page as “in demand”). The first few bags I sent I made $80 off maybe 20 items…twice. Then $40 on a bag full of newish dresses and shoes. Then $13 off a bag so packed to the gills I had to reinforce it with duct tape. Then today I see that they’re charging $9.99 for a bag fee. Forget it. Not worth the effort anymore. I’ll donate to goodwill. From the 2 articles, Thredup was not profitable in 2015 and this type of business generally has low profit margins. There’s a reason the payouts are low. Personally, the easiest way to get rid of clothing is just to give it away. I used to sell my items at Plato’s closet (a used clothing store) and got tired of getting my items denied because of “wear” and because they weren’t “on trend”. Payouts at Plato’s are also very low. These type of stores have to have low payouts in order to stay in business, so if you’re going to sell at these establishments, expect little $. sOMETHING i FEEL OBLIGATED TO ADD/ASK – FOR PEOPLE THAT ARE REALLY UPSET, ARE YOU DOING THE MATH OF WHAT THE ACTUAL PAY OUT IS? a LOT OF IT CALCULATES TO 10-15% PAID TO YOU OFF WHAT THEY SELL IT FOR. iSN’T THAT WHAT THEY CLEARLY STATE IS THE PAY OUT RATE?? I tried Thred Up last year. I sent in over 20 name brand labels they requested and made $9.09. That’s less than .50 an item. It was disappointing but I thought, oh, well, I made a little bit of money. I just cleaned my closet today and wanted to send some items in, but now I see they charge $9.99 for a clean out bag that they deduct against what you earn. For what I got last time, I would owe them money! So I don’t want to take a chance, I’ll just donate the items to Green Drop for the veterans. Where/what is the referral link? The referral link works like a coupon. If you click it, it’ll take you to ThredUp, and if you make a purchase you should get $20 off your order! Thanks. I love shopping on Thred up, but after reading everyone’s comments, I’ll just list my items on eBay. I’ve been selling for years on eBay with no hassles. Its now free to list and I don’t find the fees to be high. With the shipping discounts you get, often the fees are covered. Most of my clothes are not name brands anyway so they’d probably get rejected. Glad I didn’t wate my time with this clean out bag. Since I made a purchase, the clean out bag was free. They sent it with my first order, I didn’t request it. Good luck to you all. I agree with Jennifer. Don’t waste your time with ThredUP even with decent clothing. I sent it a bunch of clothing, one Kate Spade handbag, and lastly, one Fossil bag. All items were generally in style, nothing old, nothing worn, and gently worn or new with tags. In fact, I could’ve sold all this stuff on eBay for much more money, but I didn’t feel like going through the hassle. Wrong move. With three full bags of items that would’ve sold for $700 (my RESALE price, not retail! ), they rejected almost everything and gave me a pay out of $5.05. They even insulted me afterwards by first, making me wait two weeks to receive my money, giving my money on a pre-paid Visa card, then having the nerves to ask how my selling experience was! They resold my stuff for a huge profit. They basically gave me $0.50 per item. I would never support a company with such a business model, therefore I wouldn’t buy from them knowing they ripped off their sellers. And knowing they make such a huge profit, they couldn’t spare the time to take better photographs and give SOME product measurements? Stay away! Just take some decent photographs of your stuff, upload onto eBay with some measurements, and sell there instead. I don’t find eBay as a reliable place to sell, but they’re MUCH better than ThredUp. 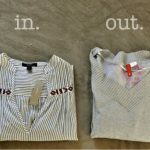 ThredUp deserve a class action lawsuit. I used the link at the beginning of the blog and I don’t see where the $20 credit is. hmmmm, i’m not sure. was it your first time using thredup? it’s only for first-time purchases. if it is your first purchase and it still isn’t working, let me know and i’ll contact customer support to make sure it’s still active! Thanks! Hello,I check your blogs named “RSS” on a regular basis.Your writing style is witty, keep it up! And you can look our website about proxy server list. 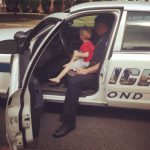 Your post and the updates are to the point about thredUP. I have sent them 3 bags and receive a total of $110 in payouts, all of which I used to buy stuff on their site. I’ve had mixed success with stuff I’ve purchased, having to return more than half the items, which didn’t fit or had other issues. I had originally decided not to send any more stuff to them after they instituted the $10 fee on clean-out bags, but then I got an email saying they were going to charge me only $4.99, so I decided to give it another try as an experiment. I inventoried everything I sent, and calculated what I would take as a deduction if I donated the same items to Goodwill. Then I calculated what that deduction would be worth in saved taxes based on my tax rate. If the pay-out on this bag is the same or less than the tax savings, I will know that it’s not worth it to send clothes to thredUP again. I suggest others do the same. PS Obviously, if you don’t itemize deductions, my calculations are not relevant. sent my bag in with numerous great conditioned barely worn name brand clothes……I got 7.00 for 18 pieces of clothes.I wont be sending anything else!I did buy a few purses and shoes, Don’t waste your time sending clothes!give them to your local goodwill! It is a complete RIP OFF. Sell it on ebay! I sent new, tagged designer clothing. 11 pieces– in season! Made $1.10. Their explanation? I should have gone through the list of 25, 000 brands they accept (which they never made available, “too time consuming” I quote THEM) before I sent my bag. SELL IT yourself. See the Better Business Bureau ThredUp page- it is revealing. So how do I use your 20$ and you get tone too!!???? I could definitely have made more money selling my clothes on eBay, but the stuff had been sitting around taking up space and I wasn’t making time to sell it, so I sent a bag off to ThredUp. They accepted 70% of my items. 7 items have sold, for a total of $105. I made $38 for “upfront items”. There are 2 items on consignment that have not sold yet. Worth it? Not sure. I regret the money I lost by not taking the time to sell on eBay, but I am very happy with the space created in my very small closet. Yes, I agree. I’m sure you could make a LOT more on ebay. For me the time wasn’t worth it. Listing everything individually and then shipping it — much easier to fill a bag! I ordered a Cleanout Kit and then read the onslaught of negative feedback on the resellerratings website. While I’m not after a huge payout and I agree that we over-estimate the value of our belongings, it gives me pause that the bad reviews are very current and that a lot of people reported getting nothing or a pittance of a pay out, even on new items. I usually donate because I’m not sales savvy enough to deal with online selling, but if a retailer takes the same item I would donate, makes money on it and I get nothing (or a pittance) that would make me feel cheated. Makes you think… Seems to be a mixed bag when it comes to ThredUP, no pun intended! 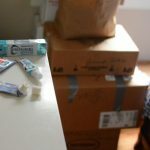 Perhaps I have been fortunate by some fluke in my experiences with thredup, but I love it! I spent over 3.5 years working for a Salvation Army and though I still donate a few times a year, working there definitely disillusioned me. Honestly, the biggest appeal is not having to lug the stuff to the donation center with my two kids in tow. In one of my bags I had 13 items accepted and got a $77.22 payout and then $133.20 for two consignment items. I only recently learned the extent of the brands they take for kids clothing, so I currently have four bags of stuff being sent to them (am moving soon and doing a full purge). I do cringe when I see some of the prices compared to what they cost me, but I try not to think about it. Overall it works for me. My experience was not very good — I tried to show through emails and sign-up that I requested consignment – even immediately when I received the upfront dollar amount. They accepted about half of my items which was no problem. The problem was that my items were selling really well, really quickly. But I never received a return email on my question of consignment vs upfront and to please correct. In about 3 wks almost 50% of the bad has sold for over $300 – my upfront is $7.65. They are easy to use, but the payout is awful. I’m planning to try ThreadUp, not because I hope or expect to make a lot of money, but because I’m looking for a easy way to clean my closet and ensure these items either end up in a good home or are utilized in a way that keeps them out of a landfill (I’m aware of and fine with ThreadUp selling rejected items to 3rd parties… still keeps them out of a dump). I’ve donated in the past to organizations like Goodwill and Salvation Army, but these organizations are for-profit and I don’t agree with some of what they stand for (and if you don’t know that the Goodwill CEO makes millions a year, or that the Salvation Army lobbies against LBGT rights in Washington, then I would highly recommend looking at them a little closer). I’ve also looked into local options, but I don’t have the time or desire to go through my bags of stuff to try to determine who can use what, where and how I can get it to them. Because money isn’t my prime motivator (just looking at it like a nice possible perk), I’m also not interested in seeking out consignment shops, or dealing with the hassle of eBay. All I want is all this stuff out of my house, and the knowledge that someone else will wear it, or it will be responsibly recycled. If I get a few bucks for it, all the better. If they accept nothing, I’m still winning (as the Clean-out bag with no return assurance is free)- the stuff is out of my closet and I know its being recycled. I’m glad I read this article, and all the comments, as my expectations have certainly changed a little, but because I don’t have any serious expectations about making money, I expect to be pretty happy with the whole experience. YES YES YES! I totally agree with everything you said. If I wanted to make money I’d do the footwork involved with selling on eBay or locally to consignment stores. But since I’m NOT willing to spend the time on that, ThredUp is SUCH a great alternative. 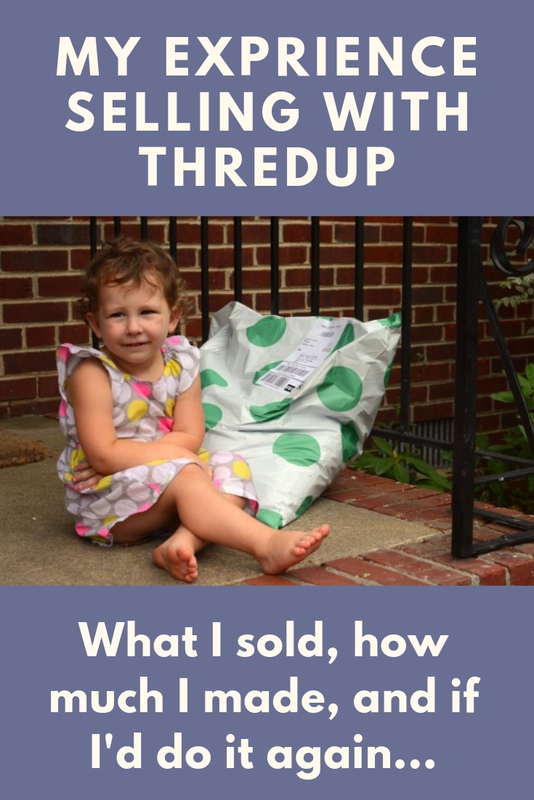 Since writing this several years ago I’ve continued to shop and sell with thredup, and sometimes I get a good payout, sometimes not. But either way, my closet is refreshed! I just ordered a clean out bag, and it says on the site that it’s free. The only one that costs money is if you want stuff returned it’s $16. Am I crazy? Is the $10 fee from last year no longer their policy? Are they going to trick me into that $10? I’m a little concerned now. Yes! I think they added the $10 policy, and then changed it back. I need to re-update the post! How long did it take for them to send you a bag. I’ve literally been waiting for about a month. It’s honestly insane to be waiting this long. it does take a long time! i’ve waited more than a month before. i think you can track the bag on their website to see where it is in the process.